Students often ask us how the year works at UCT’s English Language Centre. Although we are part of UCT, we don’t work in exactly the same way as the university classes. For one thing, we are open ALL year round and you can start on any Monday. Here is more information about the rhythm of the year at ELC. How is the year divided? Students studying degrees at UCT have the luxury of long summer holidays and 4 holiday periods per year. ELC is open ALL the time, except for South Africa public holidays so we run on our own schedule. We use 4 coursebooks a year, rotating them so that you never have the same textbook. Each term is 3 months long. How do the coursebooks work? Each coursebook is divided into units and terms are usually about 12 or 13 weeks. The coursebooks we use include New Language Leader as well as the National Geographic Life series as well as specific ones for IELTS. It generally takes between 8 and 12 weeks to complete a level. Obviously the harder you work, the better! Moving up is also based on assessment. We use continuous assessment. This means that everything you do is assessed including attendance, participation, and homework. You will also have assessments every Friday, which will be based on one of the skills – reading, writing, listening or speaking. These are formal tests and your grade will be recorded on your mark sheet. Each student also has their own writing book which is continuously assessed by your teacher and your homework is also monitored. 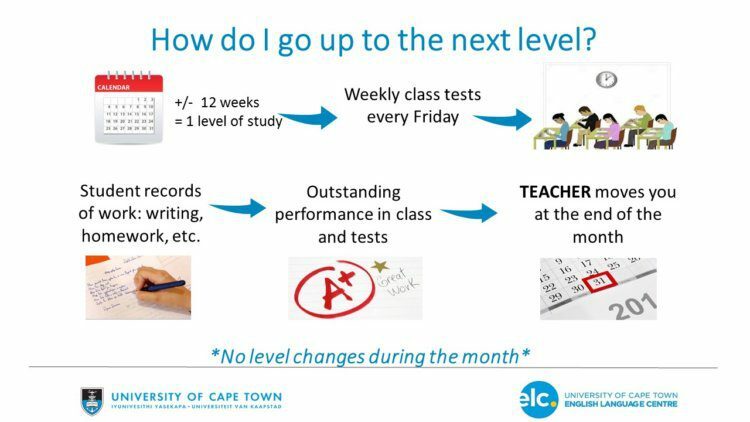 How do students move up to the next level? If you have outstanding performance in class, do well in your weekly assessments and do all of your homework, your teacher may decide to move you to the next level. Level changes only take place at the end of each month. So, in summary, Rome was not built in a day. This means that something big and beautiful takes time to build. Learning the English language takes time so just keep working hard, trust your teachers and enjoy your year at UCT’s English Language Centre.